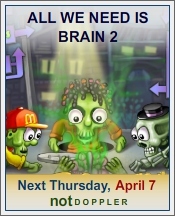 All We Need Is Brain 2 comes out this Thursday and will be playable at its creator site NotDoppler. Read more details for All We Need Is Brain 2 and watch the full video walkthrough. Strategically place those tasty green brains and lure the zombies to their death! Drop some smelly brains and watch the undead how they raise out from their own graves following the sweet stench… And then dispose of them! This second time around, you’ll be given new weapons at your disposal, more features to enhance the gameplay and more level! You skipped three levels (12, 13, 14). Nice move. Heya Chance thanks for notify that and leaving a reply about this error.. The walkthrough is updated and now it includes the skipped levels. Enjoy playing. Nice post. I was checking continuously this blog and I’m inspired! Extremely helpful info specially the last phase I maintain such information a lot. I was seeking this certain info for a long time. Thank you and good luck.